From bad to beautiful. A vented crawl space with appearance and performance problems can be transformed by encapsulation using the CleanSpace® System. It’s easy to underestimate the impact your crawl space has on your home. After all, it’s not a place that’s visited on a regular basis. But the truth is that the condition of your crawl space really does have far-reaching effects that can cost you money while also compromising the value and safety of your home. Many of these issues have to do with crawl space ventilation. Builders have always loved crawl spaces because they’re easier, faster and less expensive to build than full basement foundations. The traditional, “old-school” crawl space has openings or vents in crawl space walls that allow outside air to circulate below your living space. If insulation is installed, it’s usually in the form of fiberglass batts that are placed between crawl space joists. The crawl space floor will be soil or poured concrete. Over time, a vented crawl space develops a number of serious problems. In the summer, warm and moist outside air enters the crawl space and condenses on cooler crawl space surfaces. This steady dose of moisture causes mold to grow and wood to rot. Wet wood also attracts insects like termites and carpenter ants whose colonies cause additional wood damage. 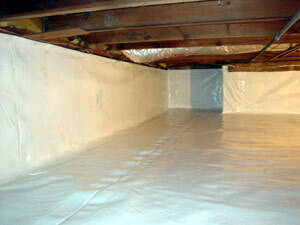 Fiberglass insulation can easily absorb moisture and sag or fall out of place, ending up on the crawl space floor. Cold winter weather brings a new set of problems: cold floors because of missing or wet insulation and high heating bills. At all times of year, indoor air pollution can cause illnesses because of airborne mold spores that enter the living space through cracks and gaps in the crawl space floor. Call for a Free Estimate and inspection from a certified CleanSpace® installer. Ask your CleanSpace® technician about drawing combustion air from outdoors. High humidity and condensation on crawl space surfaces. Visible mold stains on crawl space surfaces. Cold floors upstairs during winter months. High heating & cooling costs. If your crawl space has any of the problems mentioned above, don’t worry. Today, building scientists (the engineers who study how buildings perform) recommend that a vented crawl space be sealed or “encapsulated” to isolate this under-house area from exterior temperature and humidity conditions. 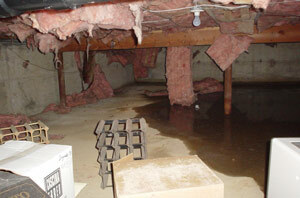 Crawl space encapsulation is a proven method for ending all the problems that plague vented crawl spaces. And your Basement Systems dealer has the training, tools and patented materials to encapsulate any crawl space -no matter what size or condition. The industry-leading CleanSpace® System from Basement Systems includes an exclusive selection of patented products that work together to transform problem crawl spaces. A finished CleanSpace® installation looks as good as it performs, replacing your dark, dirty crawl space view with a vision you can be proud of. Your crawl space should also be properly insulated, with the right services from a certified technician. Call today for a free estimate on any of our crawl space services or for more information on our CleanSpace® Crawl Space Encapsulation System. Gas or oil fuel burning appliances need adequate air to operate properly. Without it, a hazardous situation can occur.